Phone today to arrange your in house pool table move or your couch removal. Have professional Packers pack your belongings for your move or to store. Professional Packers will do any size house in just one day. The professional packing teams at Galaxy are hard working efficient workers. After experiencing Galaxy Packing and Unpacking Services you will never want to pack yourself again! Everything you need for your move, WE WILL PROVIDE, when you book your move with Galaxy Moving we deliver necessary boxes and packing paper directly to your door days before your move. Visit our Moving Supplies page for more details. Moving to or within B.C. We do hundreds of inter-province moves every year. 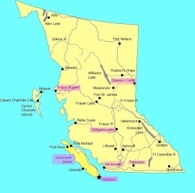 We regularly move Customers all-over British Columbia. The benefit of hiring an Independent Moving Company means, your goods will remain in our Moving truck, Other Moving Companies may transfer your goods. The exclusive moving service within BC include packing, transport, unpacking and assembly depending upon your needs. 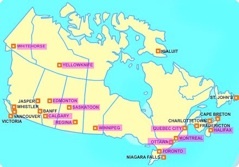 We’ll move you anywhere in Canada. Trust Galaxy Moving full-service residential and commercial moving services to make moving across Canada a lot easier, convenient, and less stressful, by taking advantage of Vancouver’s Premier Moving Company. Expect superior service from Galaxy professionals, who help with all the paperwork you are required for Canadian or US customs. 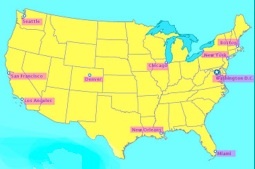 Our crews have extensive experience moving individuals and families to and from the USA. At Galaxy Moving & Mobile Storage we cater to each and every need of our Customers. Our services go above and beyond a typical Moving Company. 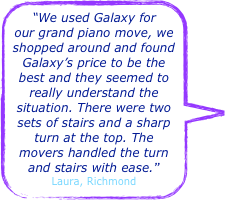 Continue reading to learn just what Galaxy Vancouver Moving has to offer you. FAQ: How Does Galaxy Moving Vancouver, keep their rates so much lower than their ‘competitors’? 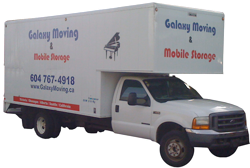 Galaxy Moving Vancouver is an Independent Moving Company. We are NOT a franchise, (most of our “competitors” are franchises) this means, we don’t pay franchise fees, and have lower-overall costs. We’re happy to pass our savings onto you, our Customer, giving you an affordable Moving and Storage Option. Galaxy Moving will serve you efficiently and professionally. From West Vancouver to Richmond, Downtown Vancouver to New Westminster, we ensure a stress free, fast and easy Vancouver Move. By utilizing experienced movers and professional equipment, we will move your possessions in the safest most efficient manner possible. Galaxy Movers use shrink wrap, in-house wrapping and moving blankets to protect your home and its furnishings during the moving process. Office move will be easier then you could have ever imagined. From computers, desks, filing cabinets, metal safes to heavy machinery, we’ve moved it all and safety, to any location. Galaxy Movers will wrap all your electronics and equipments in top quality packing materials. Shrink wrap, bubble wrap, or crating your equipment, to ensure everything is well cushioned and protected during transportation.